Welcome to the 12th episode of the DFB Podcast! 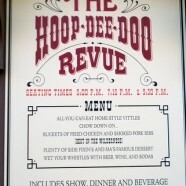 For this episode’s main segment, AJ and Brad discuss Walt Disney World and Disneyland dinner shows: Hoop Dee Doo Musical Revue, Spirit of Aloha, Mickey’s Backyard BBQ and the Fantasmic dinner package at Walt Disney World; and the Big Thunder Ranch Barbecue and World of Color dinner package at Disneyland. Q: M.Wright: What are the best WDW non-park (read: resort) locations for breakfast and lunch? Q: Rachel M.: Does Disney World distinguish between adult and child counter service credits on the Disney Dining Plan? Got a question? Send it to podcast@disneyfoodblog.com with “Question” in the subject line. Name three types of hot pretzels you can get in Disneyland and Disney World. Send your answer to trivia@disneyfoodblog.com to be entered to win. 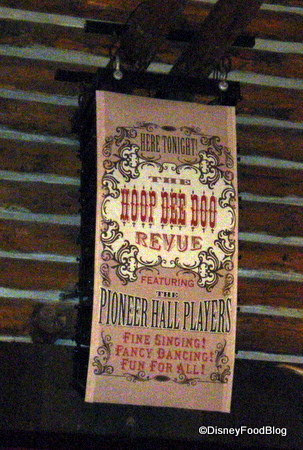 About the Picture: The stage sign for arguably the most popular dinner show at Walt Disney World, the Hoop Dee Doo Musical Revue! 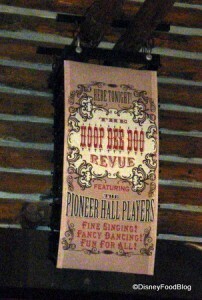 More Dinner Shows: See more on Hoop Dee Hoo, Spirit of Aloha, Mickey’s Backyard BBQ, Big Thunder Ranch BBQ, the Fantasmic dinner package and the World of Color dinner package. I loved the HDDMR. I’m thinking of trying the luau this year. JoAnn — Let me know what you think! Keith — I love it! @Marc – My family and I loved Biergarten in Germany. Good food, good (liter sized) beer plus lively entertainment = a winner in my opinion. A word of caution, unless you have a large party you will be seated with other guests. No problem for us as we enjoy talking with others. We found out we were “neighbors” (i.e. we’re from the same state)with the family seated with us. So glad to hear the positive review of HDDMR! We’re going for the first time on Valetine’s Day. I loved to hear that it’s bottomless beer! Great podcast! You’ve helped me plan out my ADRs. Marc — Epcot’s Biergarten is great! We’ll have to do a show on what we call “entertainment” restaurants, like Biergarten, Sci-Fi, ‘Ohana, etc. The show here is cute, and the musicians are very talented! It’s worth timing your visit to see it. Jon — Thanks for sharing your review! Chris — YAY! Have SO much fun. We had dinner at EPCOT’s Germany just before Christmas. The kids got up and danced. The band leader told them a Christmas tale. I got to eat great food. A perfect night. 2 Questions: What foods are basically the same throughout WDW (or IRL, like popcorn)? So we don’t splurge or take time getting something somewhere, when we could get it cheaper or in a more relaxed/pleasant setting elsewhere? Related: are there things (foods, places, etc.) that we should avoid — for whatever reason?